SARASOTA – The Sarasota Bay Estuary Program (SBEP) is supporting a study of macroalgae in Sarasota Bay. The study is designed to look at the nutrient dynamics of those balls of rolling “seaweed” found along the bay bottom, more commonly known as macroalgae. Like seagrass and phytoplankton, these plants have a voracious appetite for nutrients, and will bloom out of control when the nutrient dynamics are out of balance. The massive piles of algae that washed ashore along Sanibel Beach in 2007 were an example of this imbalance. Dr. Brian Lapointe from Harbor Branch Oceanographic Institute in Ft. Pierce is leading the study. He’s being assisted by SBEP staff scientist, Dr. Jay Leverone. Dr. Lapointe is a renowned expert in algae and nutrient dynamics, and has led many studies in Florida and other coastal locations around the World. Sarasota and Manatee County have donated staff time, boats and equipment to support the study. 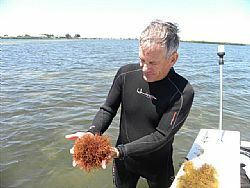 The study involves collecting macroalgae seasonally from different areas of Sarasota Bay. The most abundant algae are identified and analyzed to identify the source of nutrients (wastewater, agriculture, atmospheric). This analysis helps researchers determine the degree that the algae are nitrogen limited or “starved”. Other data such as temperature, salinity and the percentage of dissolved oxygen help researchers understand the environmental setting in which the algae are growing. The study thus far has occurred during a dry period which means less nutrients running into the Bay following rainfalls.